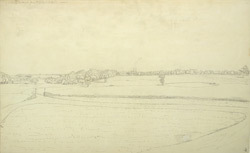 A general outline view in ink of Southwell, as seen from Sir Richard Sutton's house. The town has ancient roots and the wells nearby brought the first inhabitants here. The 11th century minster is built on the site of an earlier Saxon church, which in turn is built over Roman structures.